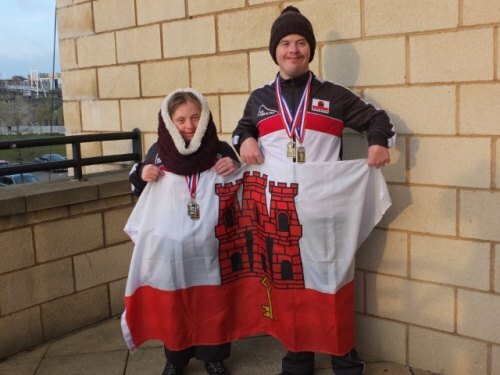 After returning from the Special Olympics with a gold medal for his open water swim , Adam Stewart along with his sister Lucy have been competing at the Down Syndrome Swimming Federation Open European Championships at the Quays Southampton on the 6/7th April winning a handful of medals, Adam won 3 gold , 1 silver ,1 bronze and Lucy 2 silver, 1 bronze plus 4th place ribbons. They both improved on there times in most races with Adam knocking 14 seconds off his 100 meters freestyle. There were around 200 athletes from 10 years old upwards competing at all levels, although its a small event and the athletes have known each other well over the years but the competition is very fierce. Each year there are more young athletes coming along and the standard of swimming is improving greatly.